(NT: Mullah Nassr Eddin, or has he is also called, Hodja Nassr Eddin, is, it seems, little known in Europe and America, but he is very well known in all countries of the continent of Asia; this legendary personage corresponds to the American Uncle Sam or the German Till Eulenspiegel. Numerous tales popular in the East, akin to the wise sayings, some of long standing and others newly arisen, were ascribed and are still ascribed to this Nassr Eddin.). That Greek language, the spirit and essence of which were transmitted to me by heredity, and the language now spoken by contemporary Greeks, are as much alike as, according to the expression of Mullah Nassr Eddin, "a nail is like a requiem"
In this respect, the extraordinarily curious fact and one even in the highest degree worthy of your love of knowledge, perhaps even higher than your usual conception, is that from my earliest childhood, that is to say, since the birth in me of the need to destroy birds' nests, and to tease my friends' sisters, there arose in my, as the ancient theosophists called it, "planetary body", and moreover, why I don't know, chiefly in the "right half", an instinctively involuntary sensation, which right up to that period of my life when I became a teacher of dancing, was gradually formed into a definite feeling, and then, when thanks to this profession of mine I came into contact with many people of different "types", there began to arise in me also the conviction with what is called my "mind", that these languages are compiled by people, or rather "grammarians", who are in respect of knowledge of the given language exactly similar to those biped animals whom the esteemed Mullah Nassr Eddin characterizes by the words: "All they can do is to wrangle with pigs about the quality of oranges�. To tell the truth, it is not this which is now chiefly worrying me, but the fact that at the end of this reading I also constated that in the sum total of everything expounded in this chapter, the whole of my entirety in which the aforesaid "I" plays a very small part, manifested itself quite contrary to one of the fundamental commandments of that All-Common Teacher whom I particularly esteem, Mullah Nassr Eddin, and which he formulated in the words: "Never poke your stick into a hornets' nest". Wait! Wait! ... This process, it seems, is also ceasing, and in all the depths of my consciousness, and let us meanwhile say "even beneath my sub consciousness", there already begins to arise everything requisite for the complete assurance that it will entirely cease, because I have remembered another fragment of life wisdom, the thought of which led my mentation to the reflection that if I indeed acted against the advice of the highly esteemed Mullah Nassr Eddin, I nevertheless acted without premeditation according to the principle of that extremely sympathetic � not so well known everywhere on earth, but never forgotten by all who have once met him � that precious jewel, Karapet of Tiflis. "Really, I do not know how to advise you, my dear Captain. Ah yes ... in that solar system where I existed for a long time, there is a planet called Earth. On that planet Earth arose, and still continue to arise, very strange three-centered beings. And among the beings of a continent of that planet called 'Asia', there arose and existed a very wise three-brained being whom they called there 'Mullah Nassr Eddin'. "For each and every peculiar situation great and small in the existence of the beings there", Beelzebub continued, "This same terrestrial sage Mullah Nassr Eddin had an apt and pithy saying. "Having made this organ grow in the presences of the three-brained beings and having seen that it would work, the Most High Commission consisting of Sacred Individuals headed by the Archangel Sakaki, reassured and with good consciences, returned to the center, while there, on the planet Earth which has taken your fancy, the action of this astonishing and exceedingly ingenious invention began from the first day to develop, and developed, as the wise Mullah Nassr Eddin would say � 'like a Jericho-trumpet-in-crescendo'. "It is necessary to remark that the books written by contemporary 'writers ' there, are, all taken together, the principal cause that the Reason of all the other three-brained beings is becoming more and more what the venerable Mullah Nassr Eddin calls 'stuff and nonsense '. "And so, my boy, the strangeness of the psyche of the contemporary three-brained beings of this peculiar planet was revealed in the given instance in this, that when this writer and his 'Gospel ' had been publicly anathematized with this 'anathema ', the result for him was, as the highly esteemed Mullah Nassr Eddin once again says: 'just roses, roses '. "But, as a matter of fact, when I was on that planet for the last time and, having heard of the said writer, once went myself especially to see him, on quite another matter, he was according to my understanding not only like all the other contemporary writers there, that is to say, extremely limited, and as our dear Mullah Nassr Eddin would say: 'able to see no further than his nose ', but as regards any knowledge of the real psyche of the beings of his planet in real conditions, he might safely even be called 'totally illiterate'. "And in the present case there is no harm in recalling again one of these wise sentences of our dear Mullah Nassr Eddin who says: " 'Struth! What might not happen in this world. A flea might swallow an elephant. '" "All, without exception, of the three-brained beings of that planet who have attained the age of a responsible being, and even those many and various 'wiseacrings ' existing there which they call 'sciences ', are categorically certain that all the said phenomena arrive on their planet completely, so to say, ready-made, 'd-i-r-e-c-t-l-y' from their own Sun... and as Mullah Nassr Eddin would say in such cases, 'no more hokeypokey about it'. Having said these last words, Beelzebub, after a little while, with a bitter smile, continued to talk as follows: "You, for instance, have the normal presence of a three-brained being, and within your presence, there is intentionally 'implanted ' from without, 'Oskiano ', or as they say there on the Earth, 'education ', which is founded on a morality based solely on the commandments and indications of the UNI-BEING HIMSELF and the Most Holy Individuals near to him. And yet, if you should chance to be there among them, you would be unable to present the process in yourself of the 'being-Nerhitrogool ', that is, the process, which, again there on the Earth, is called 'irrepressible inner laughter ', that is to say, you would not be able to restrain yourself from such laughter, if in some way or another, they were suddenly clearly to sense and understand, without any doubt whatever, that not only does nothing like 'light ', 'darkness ', 'heat ', and so on, come on their planet from their Sun itself, but that their supposed 'source of heat and light ' is itself almost always freezing cold like the 'hairless-dog ' of our highly esteemed Mullah Nassr Eddin. "Not a single one of those 'sorry-scientists' has ever thought that the difference between these two cosmic processes is just about the same as that which the highly esteemed Mullah Nassr Eddin once expressed in the following words: "'They are as much alike as the beard of the famous English Shakespeare and the no less famous French Armagnac'. "It is the same with your favorites on the planet Earth. They also have added to the name of every person the word 'Mister' or sometimes a whole meaningless phrase expressing the notion for which our honorable Mullah Nassr Eddin has the following sentence: "And namely he says: "'Nevertheless, there's more reality in it than in the wiseacrings of an "expert" in monkey-business'. "The following is what happened: "Gornahoor Harharkh with all those unusual heavy appliances which had been put on him as well, suddenly found himself at a certain height above the chair and began to flounder, as our dear Mullah Nassr Eddin says 'like-a-puppy-who-has-fallen-into-a-deep-pond'. "Let us rather return to the tale I have begun about the Omnipresent-Okidanokh and my essence-friend Gornahoor Harharkh, who was, by the way, at one time considered everywhere among ordinary three-brained beings as a 'greet-scientist', and is now, though he still continues to exist, not only considered not 'great', but thanks to his own result, that is to say, to his own son, is what our dear Mullah Nassr Eddin would call a 'has-been' or, as he sometimes says in such cases, 'He-is-already-sitting-in-an-old-American-galosh'. "You probably do not know yet what the Sacred-Aliamizoornakalu over an essence means? I shall later explain it to you in detail but meanwhile I shall simply use the words of our dear Mullah Nassr Eddin who explains this process as 'giving-one's-word-of-honor-not-to-poke-one's-nose-into-the-affairs-of-the-authorities'. "But to the grief of every Individual with Pure Reason of any gradation whatsoever and to the misfortune of the three-brained beings of all succeeding generations who arise on that planet, the first succeeding generation of the contemporaries of this genuine Messenger from Above, Saint Buddha, also began, owing once again to that same particularity of their psyche, namely, of wiseacring - which until now is one of the chief results of the conditions of the ordinary being-existence abnormally established there to wiseacre with all His indications and counsels, and his time to 'superwiseacre' so thoroughly that there reached the beings of the third and fourth generations nothing else but what our Honorable Mullah Nassr Eddin defines by the words: " 'Only-information-about-its-specific-smell'. "So, dear Ahoon", commented Beelzebub, and he added, "Thank you for this information.... Glory be to our CREATOR . . . What you have just said will probably help to destroy in my presence the anxiety which arose in me when I first constated the abnormal growth of those said Tibetan mountains, namely, my anxiety for the complete disappearance from the Universe of the precious memory of our Endlessly Revered Wisest of the Wise, Mullah Nassr Eddin". "And as for the objective reality of the theories of both these 'great' terrestrial 'learned beings', I am reminded of one of the wise sayings of our esteemed Mullah Nassr Eddin, namely: "'They were both very successful, though of course not without luck, in finding the authentic godmother of the incomparable Scheherazade on an old dunghill'. "These favorites of yours would in my opinion get quite a correct answer to this question which always excites them, that is the question how the apes arose, if they were able in the given case to apply one of these sayings again of our dear Mullah Nassr Eddin, who on many occasions used to say: 'The cause of every misunderstanding must be sought only in woman'. "Well then, it was after these 'partnerships' that those kinds of beings also began to appear in our Great Universe who in themselves are, as our dear Mullah Nassr Eddin would say, 'neither one thing nor the other'. "As for those beings there who are going to carry out this 'scientific experiment', and as for any benefit from it for the other three-brained beings there, it can all be pictured to oneself if one remembers the profoundly wise saying of our same honorable Mullah Nassr Eddin, in which he says: 'Happy is that father whose son is even busy with murder and robbery, for he himself will then have no time to get accustomed to occupy himself with "titillation'.
. "But all this which was beneficently established in the process of their existence they have also sent, like all their other good attainments, without even having had time to make good use of it, 'to the gluttonous swine' of our respected Mullah Nassr Eddin. "Now, my boy, that we have spoken also about these contemporary 'ultra fantasists' from among your favorites, we might as well, again imitating the form of mentation and the verbal exposition of our dear teacher Mullah Nassr Eddin, also 'illuminatingly' enlighten you about their significance, so esteemed by your favorites. "Here it is very opportune to repeat one of the profound sayings, seldom used there, of our Mullah Nassr Eddin, which very neatly defines the given case, that is, this degree of the limitation of the perception of visibility of your contemporary favorites. "These being-factors degenerating by heredity from generation to generation has brought it about that instead of a real being-psyche, such as should exist in the presence of every kind of three-brained being, there now already exists in the presences of your contemporary favorites, although a 'real-psyche' also, nevertheless one that can be very well defined by one of the wise sayings of our dear Mullah Nassr Eddin, which consists of the following words: 'There is everything in it except the core or even the kernel'. "Note, by the way, that for the definition of the importance of the learned there, our venerated Mullah Nassr Eddin also has a sentence expressed in the following words: "'Everybody talks as if our learned know that half a hundred is fifty'. "As for the information which passed from generation to generation through the ordinary mass of beings of that planet, it has either completely disappeared, having been soon forgotten, or there remains of it, as our dear Mullah Nassr Eddin expresses it, only the 'tail-and-mane-and-food-for-Scheherazade'. "How the contemporary learned beings of the planet Earth concoct their hotchpotch from scraps of information which reach them, is very well defined in one of the wise sentences of our dear Mullah Nassr Eddin which consists of the following words: 'A flea exists in the World just for one thing � that when it sneezes, that deluge should occur with the description of which our learned beings love so much to busy themselves'. "This became fully evident to me when, during the period of my last sojourn on the surface of this planet of yours, I became deeply interested in the mentioned Legominism concerning the deliberations of the Very Saintly Ashiata Shiemash entitled 'The Terror-of-the-Situation'. I began in the course of my further detailed researches and investigations relating to his subsequent Very Saintly Activities and their results, to investigate the causes in which way and why the crystallization of the mentioned factors obtained from the particles of the emanation of the Sorrow of OUR COMMON FATHER CREATOR for the actualizing of the Divine being-impulse of objective conscience, proceeded in their presences, that is to say, just in their said subconsciousness, and thus avoided that final degeneration to which are subject all the data placed in them for engendering in their presences the being-impulses Faith, Love, and Hope, and I was convinced that this strange anomaly there fully justifies one of the numerous wise sentences of our highly esteemed irreplaceable, and honorable Mullah Nassr Eddin which states: "'Every - real - happiness - for - man - can - arise - exclusively - only - from - some - unhappiness - also - real -which - he - has - already - experienced'. "A number of these learned beings were executed by him, others were imprisoned with lice, and still others were dispatched to places, where even now, as Mullah Nassr Eddin would say, 'French champagne' could not be taken. Only a few of those who were clearly shown to have been occupied with all this, only because, as it is said there, they were 'mad', were permitted to return to their own countries, and those among them who had taken no part whatever in 'political-questions' were not only also given full liberty to return to their native land, but by the order of the mentioned Persian king, their return to their native land was even accompanied with every kind of honor. "The Greeks were the cause why the Reasons of the three-brained beings there began gradually to degenerate and ultimately became so degenerate that among contemporary beings it is already as our dear Mullah Nassr Eddin says, 'a-real-mill-for-nonsense'. "As examples of the very many particularly maleficent inventions of those German beings, let us take just those five what are called 'chemical substances', now existing there under the names of (1) satkaine, (2) aniline, (3) cocaine, (4) atropine and (5) alisarine, which chemical substances are used there at the present time by the beings of all the continents and islands as our dear Mullah Nassr Eddin says: 'Even-without-any-economizing'. 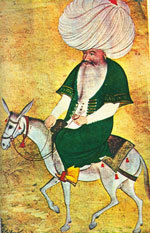 "At the present time almost all the beings who become genuine representatives of contemporary civilization very meticulously and with the greatest delight and tenderness introduce into themselves this 'blessing' of contemporary civilization, of course, always to the glory, as our dear Mullah Nassr Eddin says, of the 'cloven-hoofed'. "The confectioners and other professionals there who prepare the said tasty articles for the first food of the rest of your favorites use this same German 'sure-fire' composition, alisarine, of course unconsciously, for that purpose which has there already finally become the ideal for the whole of the contemporary civilization, which purpose is expressed in the language of our honored Mullah Nassr Eddin in the following words: 'As-long-as-everything-looks-fine-and-dandy-to-me-what-does-it-matter-if-the-grass-doesn't-grow'. "Anyhow, my boy, those contemporary substitutes for the beings of ancient Greece are already now a great help to poor Nature � though only in the process of decomposition � with all their practical attainments based on the 'sciences' they have themselves invented. It is not for nothing that our dear Mullah Nassr Eddin has the following wise expression: 'Better-pull-ten-hairs-a-day-out-of-yourmother's-head-than-not-help-Nature'. "And ever since the beings of this contemporary community started inventing these practical objects, the ordinary existence of the three-brained beings of your planet has been, just as our dear Mullah Nassr Eddin says, 'not-life-but-free-jam'. "But thanks to the adaptations of every kind invented by those contemporary beings, it is now as again our esteemed Mullah Nassr Eddin says, 'just roses, roses'. "In short, what happens in their psyche is just what our dear teacher Mullah Nassr Eddin defines by the word a 'mix-up'. "This new invention there, this language Esperanto might however do for our highly esteemed Mullah Nassr Eddin for composing the amusing anecdotes he tells his hens . . . ! "In short, this promising beginning of theirs, in this business of establishing one common planetary language, changed nothing there in their 'height of absurdity' and everything remained as before down till now, that is, this comparatively petty planet, with a petty 'half-dead terra firma', continues to remain, as again our dear teacher Mullah Nassr Eddin says, 'a thousand-tongued hydra'. "And at the present time there, when the functioning of his planetary body in one or other of your contemporary favorites becomes deranged in this or that respect, and when this being ceases to be able to fulfill his being-obligations, these contemporary physicians of theirs are also called in for help; and, no question about it, these physicians do also indeed come; but how they help and how they discharge by their inner essence the obligations taken upon themselves, it is precisely here, as our highly esteemed Mullah Nassr Eddin says, that 'the dead camel of the merchant Vermassan-Zeroonan-Alaram is buried'. "That you may the better understand the significance of the contemporary physicians on your planet, it is also necessary to tell you of the saying of our highly esteemed Mullah Nassr Eddin concerning these same contemporary physicians. "In my opinion, my boy, you will very well understand this particularly sharp 'duality-of-the-beings' of this large community, if I repeat to you word for word the opinion about them of our esteemed Mullah Nassr Eddin which he gave me personally. "It is necessary for me to tell you that during the second half of this last sojourn of mine among your favorites, I happened more than once to meet that terrestrial uniquely wise Mullah Nassr Eddin and to have personal 'exchange of opinion' with him on various, as it is said there, 'life questions'. "Even before my arrival in Ispahan, I already knew that the esteemed Mullah Nassr Eddin had left for the town 'Talaialtnikoom' to stay with the stepson of the eldest daughter of his godfather. "On ascending to the roof, and having exchanged the usual greetings with our dear, most eminent and wise Mullah Nassr Eddin, I asked, pointing with my hand to what was happening in the street, what it was all about. "Having said this, Mullah Nassr Eddin got up slowly and heavily, and again pronouncing his favorite saying: 'So-and-so-this-must-be-it' but this time with the ending 'don't-sit-long-where-you-shouldn't-sit', took me by the arm and together we descended from the roof. "Here, my boy, while giving the subtlety of the psychological analysis of our most wise Mullah Nassr Eddin its due, justice demands that it should be said that if these Russians have become such exemplary turkeys we have, in this case, to blame it only once more on those beings of the community Germany. "Well, thanks to the wise definition of the esteemed Mullah Nassr Eddin which he told me himself, I clearly understood for the first time why all the beings of that large community there, when they reach responsible age become possessors of so sharply dual an individuality. "From this moment, I had, in the sense of my 'outer manifestations', as our esteemed Mullah Nassr Eddin would say, to 'dance in everything to his tune'. "'This proves that among the Egyptians there existed a monarchical state organization and that the position of the "king" passed by inheritance from father to son, and as it was customary that the kings of one generation should have the same family name, and that all the kings who had this name composed one dynasty, then therefore they had as many different dynasties of kings as there were family names'. . . . very 'understandable', and as 'clear' as the 'patch on the baggy trousers' of the honorable Mullah Nassr Eddin. "And so, my boy, if you succeed in making anything out of this fact, then for your common presence there will be actualized in full the wise saying of our dear teacher, Mullah Nassr Eddin, which he expressed in the following words: 'The-very-greatest-happiness-consists-inobtaining-the-pleasurable-with-the-profitable'. "As regards such a condition of affairs, our wise Mullah Nassr Eddin has also a very wise saying, he, namely, says: "'If a father likes to ride though it be but a child's sled his son must obligatorily be prepared to drag the great village sleigh up the mountainside'. "Speaking briefly, the result of the mentioned two factors among the three-brained beings of this strange planet, which had been fixed in the process of ordinary existence, and, namely, the inherency in the beings belonging to the caste of the ruling class, and the psychopathy of certain of their ordinary beings, is that they always get divided on questions of religion � soon after its foundation, on whatever religious doctrines these religions may have been built up � into their famous 'sects', and these sects in their turn get divided into other sects, and thanks to this, just the same occurs there in all epochs on this comparatively not large planet in the sense of religions, as with the large number of the spoken languages there, referring to which our highly esteemed Mullah Nassr Eddin called it 'a thousand-tongued hydra', and in the present case he would say 'varied-titillating-titillations'. "But thereafter they began gradually to 'strip' also this religious teaching based on 'resplendent Love', and transformed it into something also 'resplendent', but already, as our dear Mullah Nassr Eddin says, into a 'resplendent-Terasakhaboora' from the fairy tale 'Kasoaadjy'. "But when afterwards they began imitating everything European, both these being-feelings still remaining in them began gradually to atrophy in them, and now at the present time almost all the beings of that community have become, in the sense of religiousness and patriarchality, such . . . the notion of which our wise teacher Mullah Nassr Eddin expresses by the mere exclamation: "'Eh! ... get along with you...'. "It is not for nothing that our highly esteemed Hadji Nassr Eddin says: 'What is most important is to have plenty of money, and then even our Nammus may creak'. "Here, you might as well be told that your favorites also have, as it were, a similar representation about the 'Okipkhalevnian exchange' and they have even invented a very clever name for it, namely, 'metempsychosis' or 'reincarnation'; and that branch of their famous science which in recent centuries has been created around this question also gradually became, and at the present already is, one of those minor maleficent factors, the totality of which is gradually making their Reason, already strange enough without this, always more and more, as our dear Nlullah Nassr Eddin would say: 'Shooroomooroomnian'. "Of course, if these unfortunates would only take into consideration that according to the second-grade cosmic law called 'Tenikdoa' or 'law of gravity', this same being-part � if in rare cases it does happen that it arises in them � instantly rises after the first Rascooarno of the being, or, as they express it, after the death of the being, from the surface of their planet; and if they understood that the explanations and proofs, given by this branch of their 'science', of all sorts of phenomena which proceed as it were among them there thanks to those fantastic souls of theirs, were only the fruits of their idle fancy � then they would already realize that everything else proved by this science of theirs is also nothing else but Mullah Nassr Eddin's 'twaddle'. "As I have already said, in the beginning, that is to say before the loss of the continent Atlantis, the three-brained beings of your planet too, also had an approximate understanding of the holy planet Purgatory and there even then existed several Legominism concerning it, and after the loss of that continent certain partial Legominisms concerning this holy planet Purgatory also survived through learned beings of that time who were by chance saved and began to be transmitted there from generation to generation. But later when, in the psyche of these strange three-brained beings there, that peculiar illness of theirs which I characterized by the words 'to wiseacre' began to arise, then they began their wiseacrings with this partial information which had reached them, and from this partial authentic information concerning the holy planet Purgatory there began to be formed and to be fixed, in the psyche of beings of subsequent generations, data for engendering such representations and understandings as are ideally defined by a certain exclamation of our highly esteemed incomparable Mullah Nassr Eddin, which consists of the following being-consonance 'Chrkhrta-Zoorrt! "And so, those two words then, evidently, were just the causes why the poor initiates of that time, which infected by the general psychosis, imagined that the same things were talked of in that fantastic beautiful theory of the Babylonian future Hasnamusses, but only in greater detail; and they began half consciously to insert certain details of this fantastic theory into the Legominisms concerning the holy planet, and afterwards these informations, passing from generation to generation, blossomed out with the additions of these fancies, which again our dear Mullah Nassr Eddin expresses by the one word: 'Kmalkanatonashachermacher'. "And now among them, this branch under the name of the 'theory of the law of vibrations' exists there, as our wise teacher Mullah Nassr Eddin would say, 'in clover'. "When I saw the large number of these vibrometers the being-impulse of astonishment in my common presence increased to such an intensity as that which our Mullah Nassr Eddin expresses by the following words: 'The limit of full satiety is bursting'. Two "Dionosks" later, when the intersystem ship Karnak had resumed its falling, and the confirmed followers of our respected Mullah Nassr Eddin had again sat down in their usual seats, Hassein once more turned to Beelzebub with the following words: "My dear Grandfather! May I remind you, as you bade me, about . . . the three-brained beings . . . of the planet Earth . . . about those . . . how are they called? . . . about the beings who breed and exist just on the diametrically opposite side of the place where contemporary terrestrial civilization is flourishing . . . About those three-brained beings there, who, as you were saying, are very great devotees of the 'fox trot'". "Even in this respect, the surrounding conditions of ordinary being-existence among your contemporary favorites, chiefly among those breeding on this continent, have been transformed so to say, into 'Tralalaooalalalala', or, as our respected teacher Mullah Nassr Eddin would define it, 'a soap bubble that lasts a long time only in a quiet medium'. "Now, my boy, in order that you may rest a little from active mentation, I wish for a while to confine myself entirely to the form of mentation of our dear teacher Mullah Nassr Eddin and to talk about a certain in the highest degree original custom which has prevailed during the last few years in these contemporary New York restaurants. "On the continent America, the three-brained beings have become so expert in this advertising of theirs, that it is quite possible to apply to them the saying of our dear Mullah Nassr Eddin which declares that 'that man will become a friend of the cloven-hoofed who perfects himself to such Reason and such being that he can make an elephant out of a fly'. "Although the examples themselves which were given for comparison in this document have not remained in my memory, yet thanks to the so to say 'flavor' of them which I have retained, I shall be able to give you their purport if I use the language of our respected Mullah Nassr Eddin. "For example, an ordinary good fellow with a character of as they say one of 'God's angels', suddenly became as irritable as those of whom our dear Mullah Nassr Eddin once said: "'He is as irritable as a man who has just undergone full treatment by a famous European nerve specialist'. "I must explain that from the very beginning of his responsible existence, he also became, whether by accident or by the will of Fate I do not know, a follower, and in fact a very devout follower, of our wise and esteemed Mullah Nassr Eddin, and furthermore in the ordinary process of his being-existence he has never lost the smallest opportunity to act entirely according to Mullah Nassr Eddin's unprecedently wise and inimitable sayings. And now, according to the information which has reached me by etherogram, all of a sudden he appears to be constantly acting contrary to one of the very serious and exceptionally practical counsels � certainly not accessible to everybody � of this Teacher above all teachers, which is formulated in the following words: "'Ekh, Brother! Here on the Earth if you speak the truth you're a great fool, whereas if you wriggle with your soul you are only a "scoundrel", though also a big one. So it is best of all to do nothing, but just recline on your divan and learn to sing like the sparrow that had not yet turned into an American canary'. "'Had the doctrine of this religion remained unchanged, it might even perhaps have suited these contemporary people, who, by the way, our Mullah Nassr Eddin defines by his expression, "He will blink only if you poke his eye with a rafter".
" 'But as to the manner of their fasting, one cannot help recalling the saying of our dear Mullah Nassr Eddin in such cases: "'"Isn't it all the same if I sing like a donkey as long as they call me a nightingale". "Concerning the destruction and transformation by contemporary beings of these good customs which were handed down from the ancient days of their wise ancestors, our incomparable Mullah Nassr Eddin has also a very apt and wise sentence. "But unless these buttons are pressed, the beings there are in themselves only, as again our highly esteemed Mullah Nassr Eddin says, 'pieces of pressed meat'. "Although this new group is composed of and still continues to be increased by three-brained beings breeding on the continent of Europe, where for such beings with the aforementioned possibilities it is already necessary, particularly in recent times, as our wise Teacher Mullah Nassr Eddin says on such occasions, 'to look specially with the most powerful electric arc lamps', nevertheless, I repeat, in this large group there is a larger percentage of such beings than on the continent of Europe. "And thus all those attending these 'schools' and all readers of these 'manuals' being themselves in regard to Being and in regard to information concerning reality exactly such types as our Teacher Mullah Nassr Eddin defined by the words 'nullities with an atmosphere of unendurable vibrations' began according to these indications to wiseacre; and since in the first place thanks to various other abnormalities fixed in the conditions of the ordinary existence of the beings of this new grouping, the process of reading has previously in general become an organic need of theirs, and secondly, that it was possible to appreciate the contents of any composition exclusively only by reading it through, and all the other beings of this continent, seduced, what is more, by all kinds of, as they say there, 'loud' titles read and read, then parallel with this, it was definitely noticeable how their mentation, which had already, so to say, become 'diluted' without this, continued to become more 'diluted' and still more 'diluted'. "For such power-possessing or important beings there, our wise Mullah Nassr Eddin also had a very interesting definition, and, namely, he says: "'The degree of the importance of these people depends only on the number of their corns'. "Above all, from this society something effective might have resulted because there was not a single power-possessing being among them, since on account of their same egoistic and vainglorious aims these beings sooner or later always dispatch all the accomplishments of any society whatsoever of a common planetary character of which they happen to be members � and moreover dispatch them with 'musical accompaniment' � to the famous swine of our Mullah Nassr Eddin, which always gobble up everything, without what are called 'parlor manners'. "Concerning the effective results obtained from all these good beginnings of the important beings, our worthy Mullah Nassr Eddin has also a very wise saying, namely, he says: "'Past centuries have shown us that Karabaghian asses will never sing like nightingales, nor will they refrain from indulging their noble taste for real Shooshoonian thistles'. "And regarding the same question it happens there just as our dear Mullah Nassr Eddin has already once said, namely: 'this is the highest punishment: pull at the tail the mane gets stuck, pull at the mane and the tail gets stuck'. "In order that you should obtain a more complete notion about these theocrats, it will be sufficient, if I relate to you once more one of the sayings of our highly esteemed Mullah Nassr Eddin. Concerning these theocrats there he once uttered something very strange. "Here it might as well be remarked that when some of these democrats for some reason or other occasionally occupy the places of the power-possessing beings, then a very, very rare cosmic phenomenon sometimes occurs from their actions, namely, as Mullah Nassr Eddin says, 'the very corns turn pedicures'. "And I must frankly confess to you, that it is very difficult to explain about these types there not only in ordinary speech but also in the language of our most wise Mullah Nassr Eddin. "Concerning in general a similar difference in the names there of terrestrial beings, another remarkable saying of our wise Mullah Nassr Eddin comes to my mind which he himself once told me personally. "As regards the absence of honesty in your favorites in the fulfillment of their duty towards Nature, I have just now remembered a very wise sentence of our incomparable Teacher Mullah Nassr Eddin which in the present case justifies its hidden meaning. "These were beings who, for various reasons, already lacked the possibility either of perfecting themselves or serving Nature; they were, as is said in a saying of our same Mullah Nassr Eddin, 'Neither a candle for the Angel, nor a poker for the devil'. "And concerning a misfortune of this kind, for their Nature, our very dear Teacher, the peerless Mullah Nassr Eddin, has also some very wise sentences. "And to get money from the same sources from which they drained it during that great process, as our dear Mullah Nassr Eddin says, 'As to this, nothing doing! Even a donkey can understand that peasant flesh costs nothing in peacetime'". "First of all I wish to remark and in the speech of Mullah Nassr Eddin, whom I particularly honor, to voice the thought which arises by association concerning Ahoon's words which were not peculiar to him and his assumed posture quite unusual for him.